Lets be honest — if you’re a fan of the Washington Redskins, then you have plenty of reason to give thanks during this holiday season. *Okay, maybe they’ve won an important game or two since then, but you get my point. It’s been a while. After two seasons of lackluster play and disappointment, the Mike Shanahan era finally has proven to have an enjoyable moment or two. Oh, and did I mention there’s a rookie quarterback in town who has played a pretty significant role in all of this as well? So while you’ve all already gotten your present early this year, here’s hoping the holiday season still treats you all well. 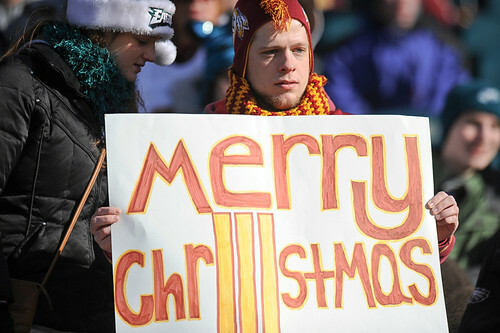 Sure, in years past ‘Skins fans have had little choice but to drown their sorrows away in a tall glass of eggnog, but thankfully, that’s not needed this year. Either way, I just wanted to take a moment to wish all of you a merry Christmas. And if you don’t do the whole Christmas thing, that’s cool too. Enjoy your Chinese food and we’ll catch up with everyone in a day or two.